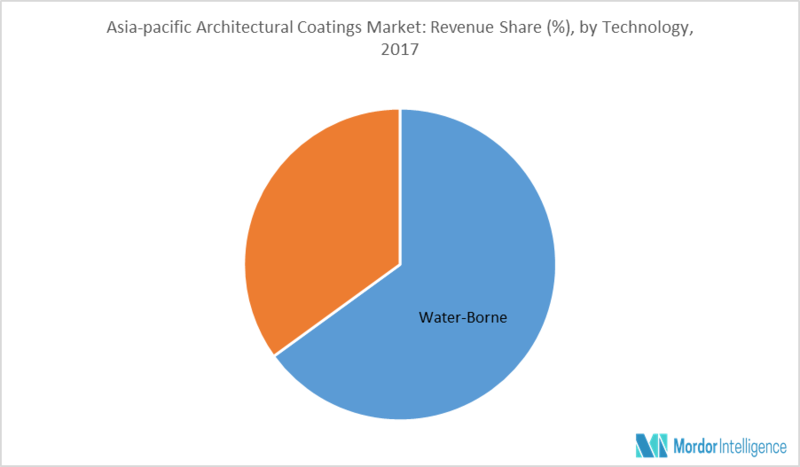 The Asia-Pacific architectural coatings market stood at 11,065.10 kilo metric ton in 2017. The market is expected to register a CAGR of 7.06% in terms of volume, during the forecast period, 2018 to 2023. Increasing housing construction activities in emerging economies of Asia-Pacific is expected to drive the market in the forecast period. The emerging economies, such as China, India, Indonesia, Vietnam and Philippines, in the Asia-Pacific region have been witnessing a strong growth in construction activities. Robust economic performance in 2017 is expected to further accelerate the growth in housing construction activities in the region. In Indonesia, millennials account for about more than 50% of the productive population. With the increasing young population in the country, the housing demand has also been increasing simultaneously. In order to cater to growing demand for affordable houses, the construction of housing units has been increasing in the country. In 2016, the country witnessed construction of 7,00,000 affordable houses. Besides this, in 2017 the country was on track to build about 9,00,000 new affordable houses in the country. In India, the government has been actively providing boost to the housing construction, where it aims to provide home to about 1.3 billion people. The country is likely to witness around USD1.3 trillion of investment in housing during the next seven years, where the country is likely to witness construction of 60 million new homes in the country. The availability of affordable housing is expected to rise around 70% by 2024 in the country. Hence, with such boom in housing construction activities in the emerging economies of Asia-Pacific, the demand for paints & coatings in the region is projected to increase substantially during the forecast period. China is the largest market for architectural coatings, accounting for around 60% of the regional market. China’s real estate sector has been growing rapidly with increased investment by the government. In 2016, property prices in China rose by about 30.0% due to increased activity in the real estate space. In China, the housing authorities of Hong Kong have launched a number of measures to push-start the construction of low-cost housing. The authorities has projected the capital expenditure in construction of HKD 23,923 million in its proposed budget for 2018-19, i.e. 7% higher than the budget allotted for the FY2017, in order to construct more affordable flats. The growth in construction is expected to boost the architectural coatings market in the country, during the forecast period. Major Players: Asian Paints, Berger Paints, Kansai Nerolac and Akzonobel, among others.